This light and completely single story bungalow, is surrounded by a huge garden with shady trees, lawn and shrubs; a lovely place to relax and enjoy your privacy! 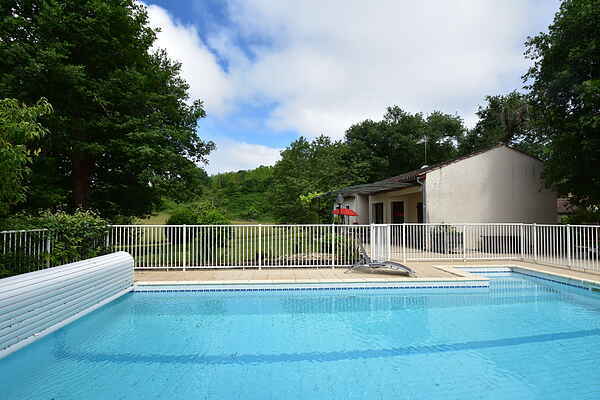 You have a beautiful heated and fenced private swimming pool. Take a refreshing dip and then go to enjoy the sun on one of the loungers. On both sides of the house are terraces with seating areas, one covered and the other one with a stone barbecue. Wonderful for a culinary end of the day! For the children there is a swing set, for the family boules de pétanque and for two adults bikes are provided! The location is ideal, including for a nice bike ride through the beautiful landscape or to go by car to one of the many attractions. Visit for example, the cozy town of Souillac, located only 5 km away. It offers all the amenities such as supermarkets, shops and markets as well as numerous restaurants and cafes around the medieval heart! At only 4km away, you can visit the famous Grottes de Lacave, and at 14 km away, the famous pilgrimage town of Rocamadour, but you can also reach the medieval towns of Martel (15 km) and Sarlat (35 km) in a jiffy.